As the seemingly endless season of farce we call the presidential election begins, I think of Diogenes the Cynic. I suppose I also think of Aristophanes, as he wrote farces aplenty and so would recognize one when he sees it, though he might, for a moment, be puzzled at the length of this one in particular. But Diogenes comes to mind primarily simply because he knew what a farce human life was then and mocked it incessantly, mocking even that high priest of he farce, Plato. They say Diogenes walked about Athens with a lantern, looking for an honest man. I've also read that he said he was looking for a human. If that's so, I think he knew what Plato and others thought we were--truly homo sapiens, or that we could and should be wise--and set about looking for what people thought they were in their foolishness, and of course finding no such thing. A farce our lives were, certainly, but just as certainly still are if we are what we seem to be; the same creatures we were in the time of Diogenes and no doubt were even before then. It's hard to defend us and if we were put on trial I doubt we could find a lawyer willing to appear at our side. We haven't changed. We remain as greedy, superstitious, stupid, gullible, fearful and hateful as we ever were, as we always have been. We may not sacrifice to the gods as we did, we may not worship the bones of saints as much, we may not en masse rely on chants and various plants to live healthy lives to the extent we have, we may not ignore the consequences of our actions quite as much as we did once upon a time, but we do it still to a significant degree, and there's no reason to think we'll stop until we've either eliminated ourselves or reduced ourselves to the point where we may start the same process all over again on an Earth less threatened by us than it is now. 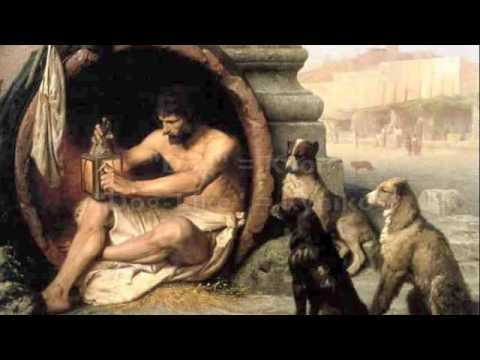 There are many stories about Diogenes. It's said he lived in a barrel, masturbated openly, ridiculed Plato and other worthies, flaunted conventions of all kinds, remarked that in the home of a rich man there's no place to spit but in his face. Looking about him today he would see no humans using even the most powerful flashlight available, let alone an honest man. He would see the same he saw each day of his life and know now if he did not know then that we're unchangeable, and merely better equipped now than we were then to sate ourselves or wreck havoc depending on our moods and means. The Earth is still no place for the man who called himself a citizen of the world. In fact, especially here in this country, we are less and less inclined to think of ourselves as similar to any other people or as united in interest with them; certainly not equal to them, but altogether better than others, unique, the favored of God. Just as the ancient Greeks were, but sadly we're unable to produce men like Diogenes.